Those backpackers in Chiang Mai looking for a booze-filled evening should look no further than our list of the best bars, clubs, pubs, and more in the northern capital. Most of the city shuts down at around midnight, so be sure to get an early move on to make the most out of your evening. 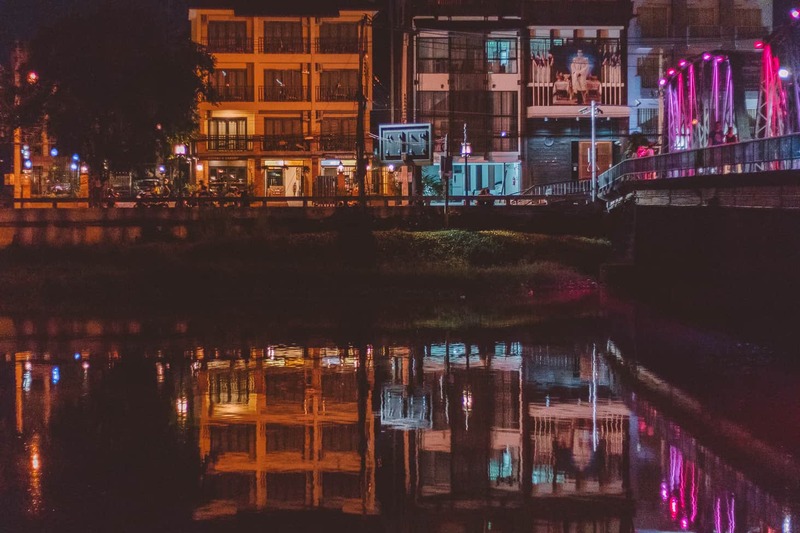 Here, a complete Chiang Mai nightlife guide for 2018! Because nightlife shuts up shop at about midnight, these backpacker bars are sure to be bumping as soon as the sun goes down. 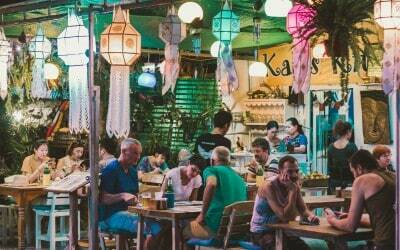 Here, the best bars for meeting other backpackers as well as expats and locals living in the city. Found within walking distance of the historic Three Kings Monument is Zoe in Yellow Bar & Night Club. Otherwise known as Zoe in Yellow, this bar is one of many in a nightlife complex in the Old City but definitely the most popular amongst backpackers. The bar, which is equipped with a dance floor and affordable alcohol-ridden beverages, is packed almost every night of the week, which is especially helpful for solo travelers looking to make a few friends on a night out in Chiang Mai. 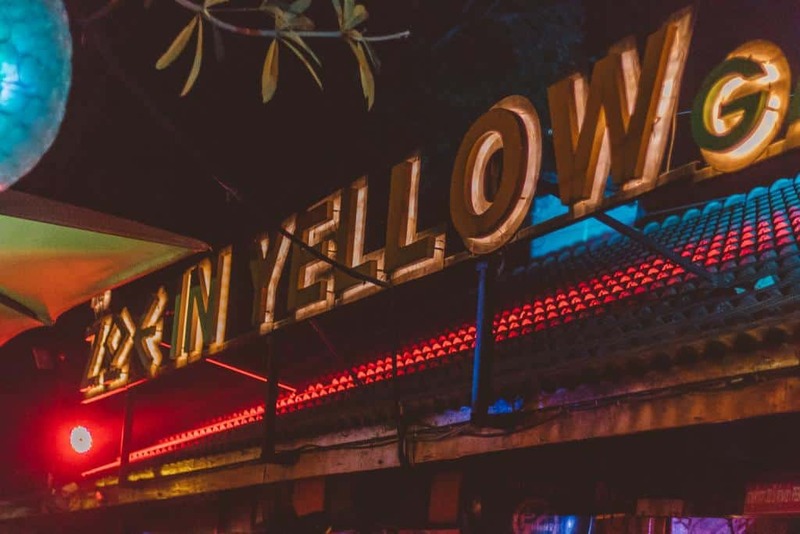 If you get bored with the top chart tunes, the bars surrounding Zoe in Yellow will please every type of partier, with everything from reggae to electronic music keeping visitors on their feet and dancing the evening away. 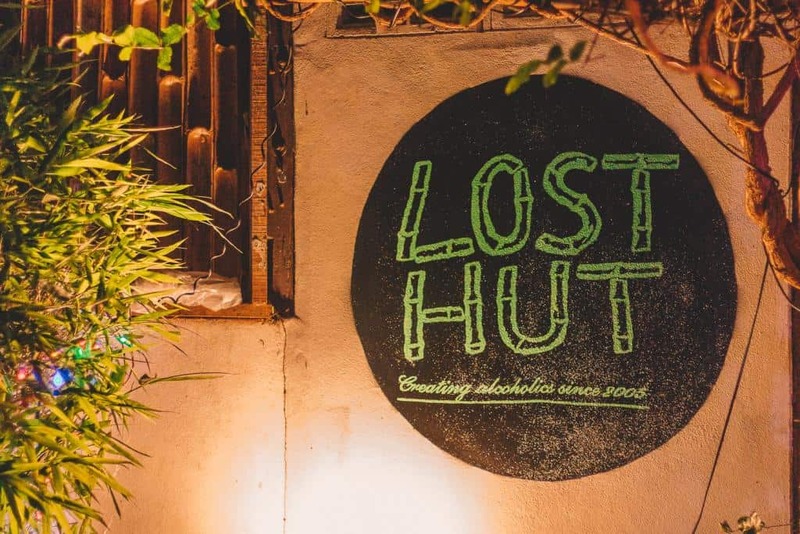 The Lost Hut is definitely a favorited bar amongst locals and expats alike. 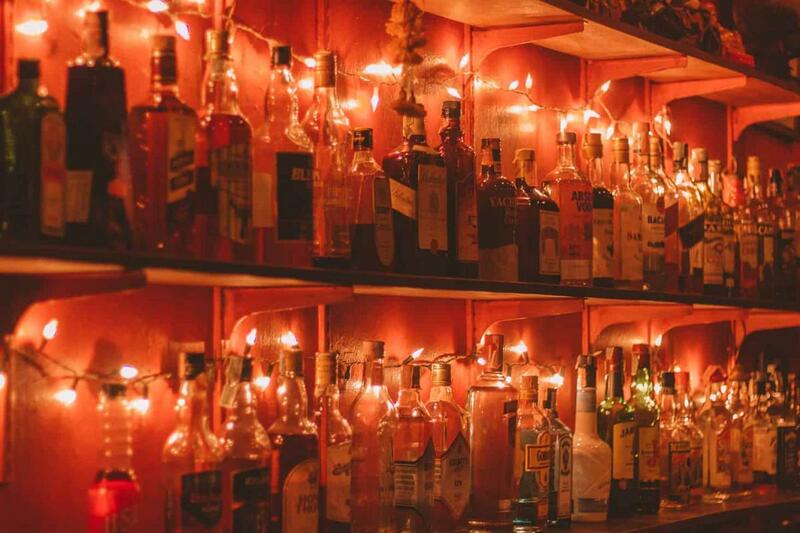 You cannot help but interact with your fellow bar-goers at this hole in the wall venue, as The Lost Hut is super intimate. Aesthetic simplicity is made up for with the incredibly kind and welcoming staff as well as affordable drinks, with a cocktail starting at only ฿120. Beer is also available for as little as ฿80. Creating alcoholics since 2005 is this bar’s slogan, so grab a drink (or two) and enjoy a night out in Chiang Mai at The Lost Hut. When we ventured to Baa(n) Din Cocktail Bar & Restaurant, we were greeted by so much more than a good happy hour and Thai food. The staff here is outwardly friendly and love to chat with customers about more than just their drink specials. 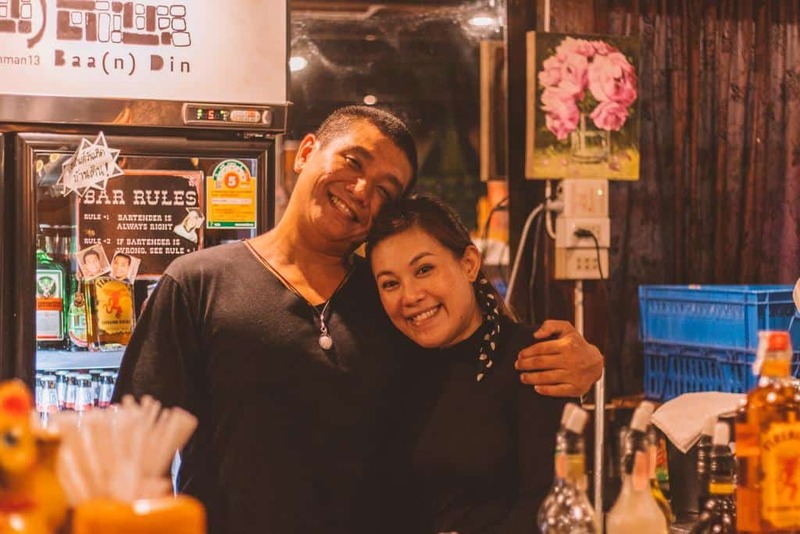 It may come as no surprise then that this bar and restaurant has its handful of regulars, so if you plan on staying in Chiang Mai long-term, this is the bar to frequent. Baa(n) Din Cocktail Bar & Restaurant is found but a short walk away from the Tha Phae Gate, making it one of the best-located bars in the city, as well. 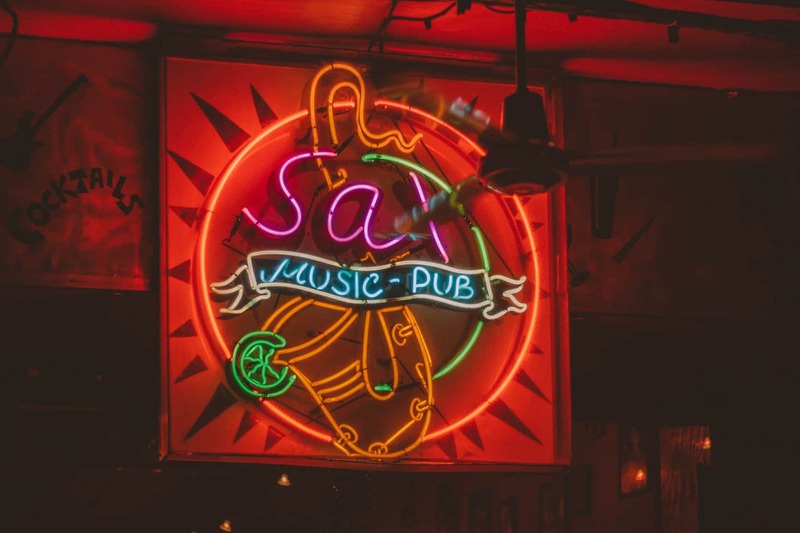 Sax Music Pub will become your after-dark home away from home while visiting the city of Chiang Mai. This pub has grown in popularity and continues to be a favorited venue after dark for years. Unfortunately, Sax Music Pub no longer has live music because they received one too many noise complaints. Regardless, it remains one of the top destinations for night owls in the city (and they still play good music, even if it is not live). The bar is right along the 800-year-old moat that wraps around the Old City and is equipped with a pool table, a large selection of cocktails, and a great vibe. Be sure to soak in the atmosphere with a drink in tow. Beers start at ฿70, cocktails start at ฿120, and shots start at ฿75. 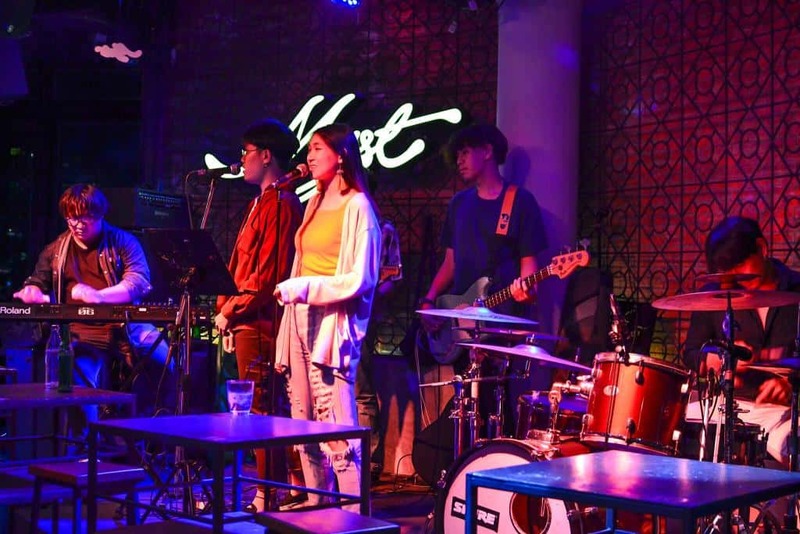 If you want to get your buzz on and fast, instead opt for one of Sax Music Pub’s selection of buckets, starting at ฿290 (Thai bucket). Hours: Daily from 5 p.m. to 1 a.m. 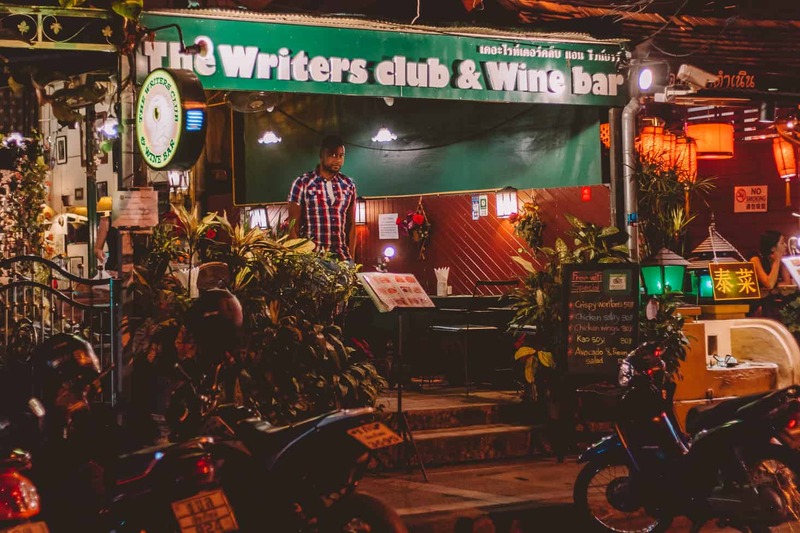 If you are looking for a venue that is a bit quieter and low-key, then maybe stay away for the backpacker-ridden bars and instead head to The Writers’ Club and Wine Bar. 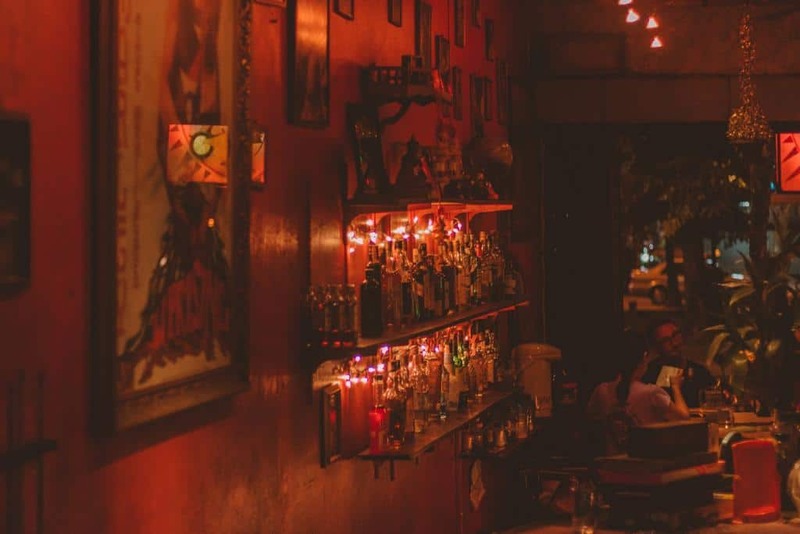 Found in the Old City, this bar, instead of being lively with music and dancing, is instead ignited by good conversation. The wine bar opened in 2003 and quickly became the unofficial watering hole for members of the press. Is it here that many writers gather, discuss what it is they are working on, and have an exchange of ideas over a glass of wine (or two). 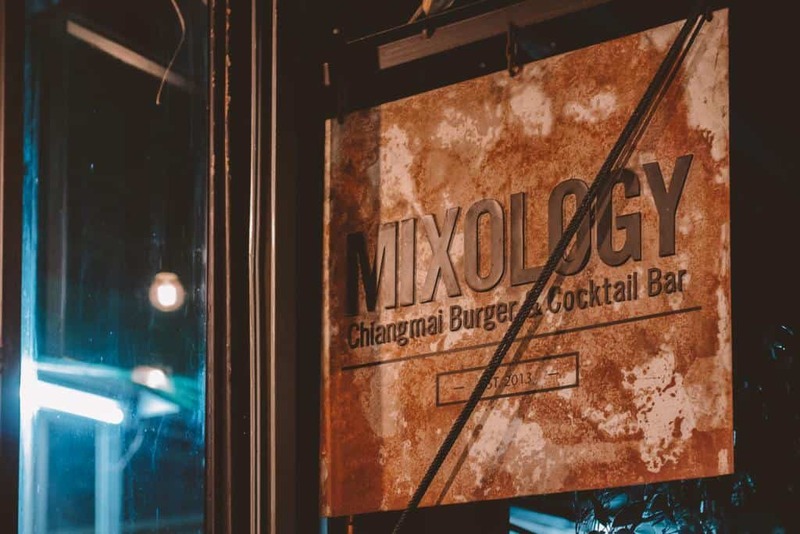 If you are looking for a class cocktail, look no further than Mixology, a burger and cocktail bar found in Old City. The venue opened in 2013 and has been attracting cocktail connoisseurs ever since. The mixologist behind the bar was certainly a sight for sore eyes after one too many mundane vodka sodas. Their most famous concoction is surely the P(r)ick me up cocktail, a vodka drink infused with some of Thailand’s most renowned ingredients, including limes, tom yum, and palm sugar. This, when mixed with coconut liqueur and prick, meaning chili in Thai, is one great drink to kick-start a night out in Chiang Mai with. 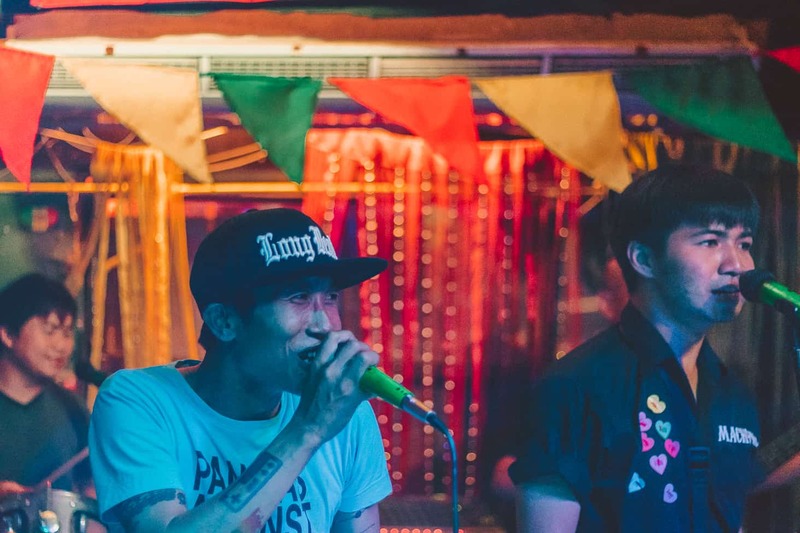 Get ready to enjoy some pitch-perfect songs at these awesome live music venues in Chiang Mai! Whether jazz speaks to your soul or you enjoy the slow and contagious tunes of a good reggae band, we have got you covered. 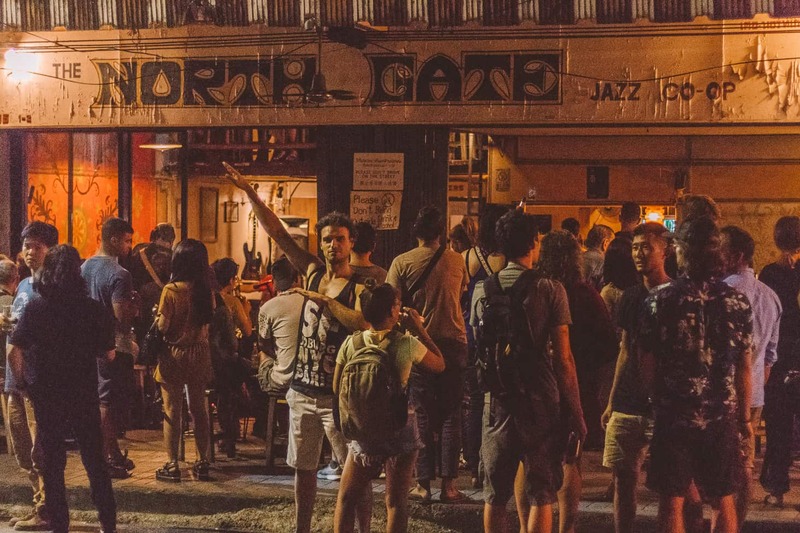 Jazz up your evening at The North Gate Jazz Co-Op. This live music venue welcomes a number of popular jazz artists (especially on Tuesdays) and crowds literally spill onto the street trying to get a glimpse of who is playing that evening. The venue, as its name suggests, is situated right in front of the historic North Gate, with the moat found literally right across the street from the venue. In addition to having great live music, this is one of the most social bars in town because of the sheer number of visitors it receives every night. The atmosphere is super conducive for meeting (and yelling over) other bar-goers, so take advantage of the social aspect, grab a cocktail, and enjoy the jazz tunes! 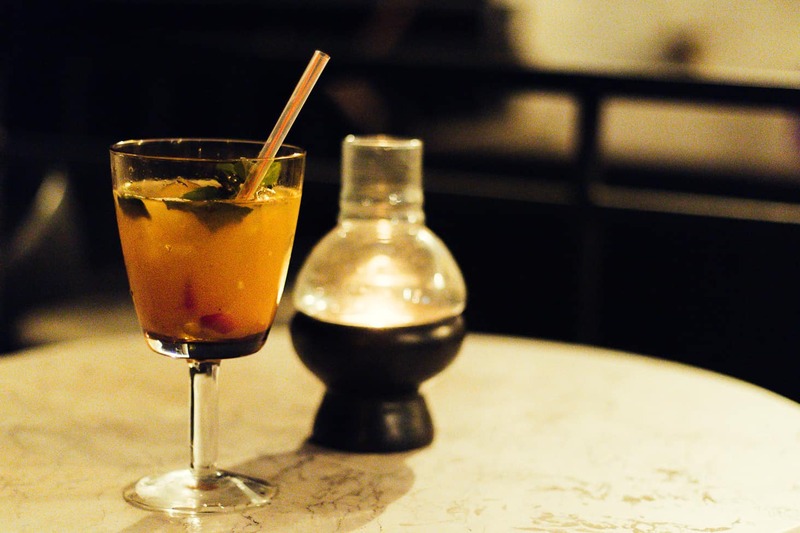 Rasta Cafe is one of the oldest bars on our list. It was established in 2004 and remains one of the most popular after-dark venues to frequent in the city. Rasta Cafe welcomes live bands every night of the week as well as all of their customers with open arms and plenty of delicious alcoholic beverages at the ready. 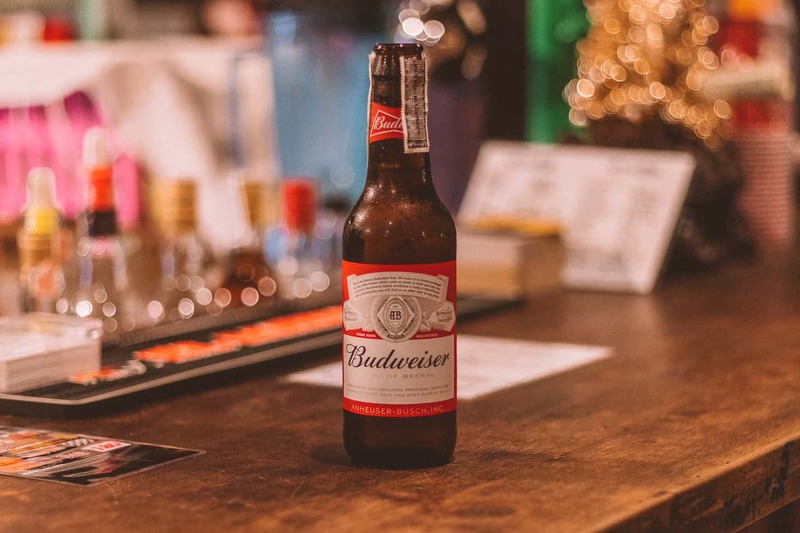 There is both indoor and outdoor seating available, allowing visitors to leave the live music long enough to chat with their fellow bar-goers or the friendly staff members here. 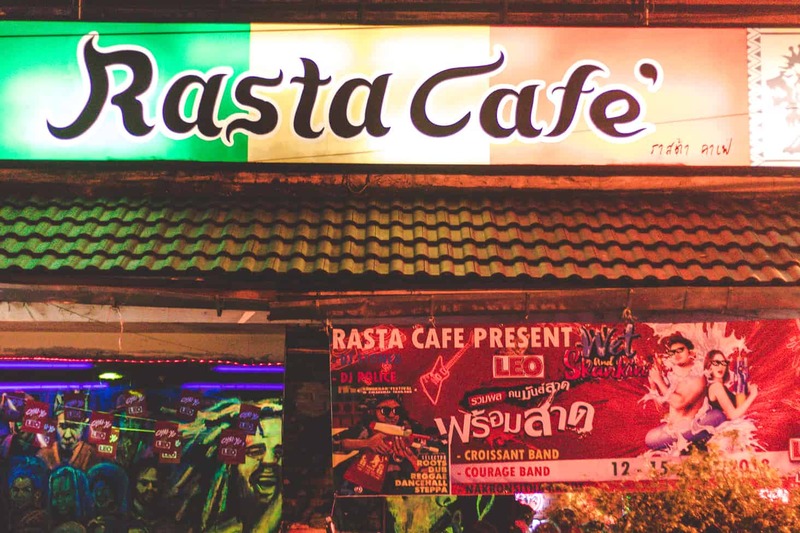 This is one reggae venue that is renowned by other similar bars around the country, so be sure to include it on your Chiang Mai nightlife itinerary! Hours: Daily from 6 p.m. to 1 a.m. Roots Rock Reggae is situated within the Zoe In Yellow bar district in the Old City. It is here that you can escape the top tracks of today and instead enjoy some of the best live reggae music in town. The bands that play are always hyped to be there and get everyone on their feet and jammin’ by closing time. 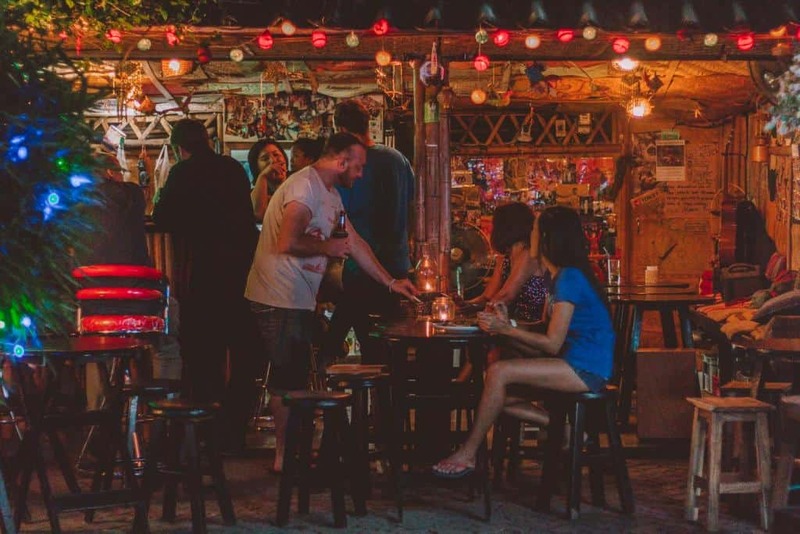 There is also an outdoor seating area that is perfect for mingling with your fellow travelers, as this is one of the most visited backpacker bars after dark. Mad Monkey Insider Tip: be sure to grab a slice of New York-style pizza from the vendor that parks just outside of this bar! Hours: Daily from 7 p.m. to 12:30 a.m. High-rise buildings are hard to come by in Chiang Mai. You will notice that most of the buildings here are about the same height. Regardless, the rooftop bars in the city still please all those who climb multiple staircases to frequent them. 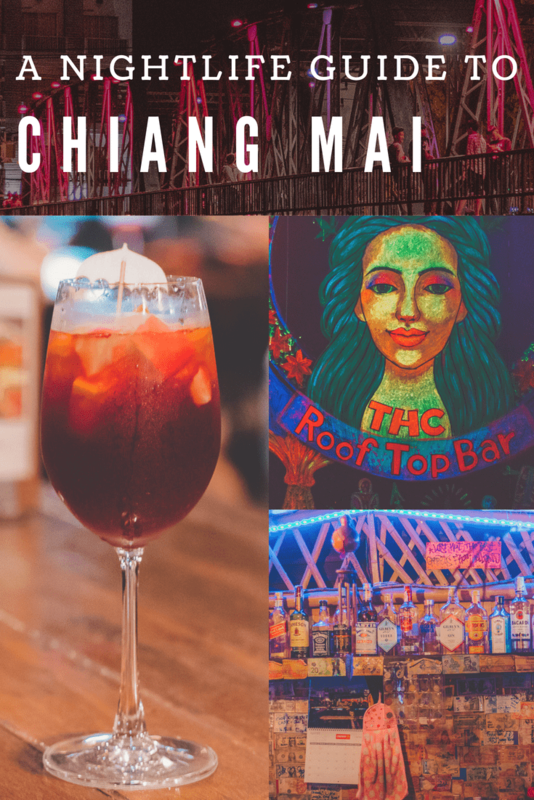 Get your walking shoes on as we unveil the best rooftop bars in Chiang Mai! 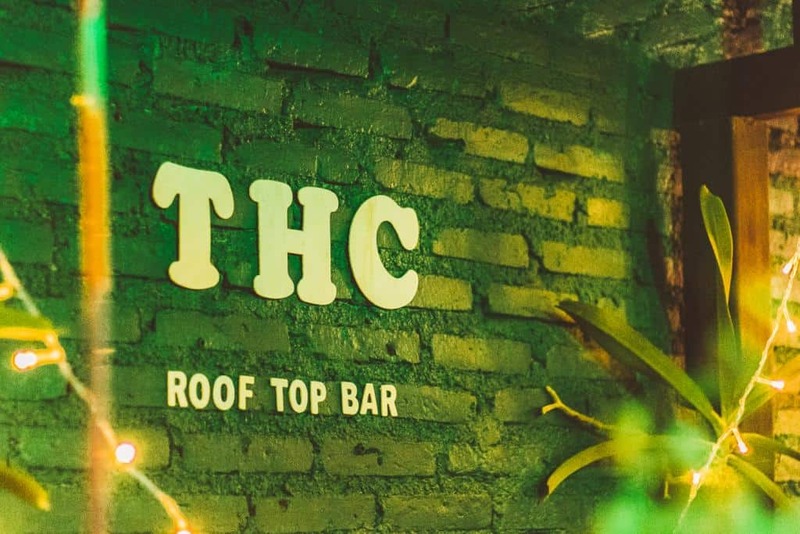 Do not let its name fool you: visitors will not find copious amounts of THC at THC Rooftop Bar. What they will find is a relatively young crowd enjoying the cool, neon artwork as well as the electronic music here. Pull up a floor cushion and enjoy one of the cheap (yet strong) cocktails here or instead take to the rooftop terrace and people watch right in front the old moat. 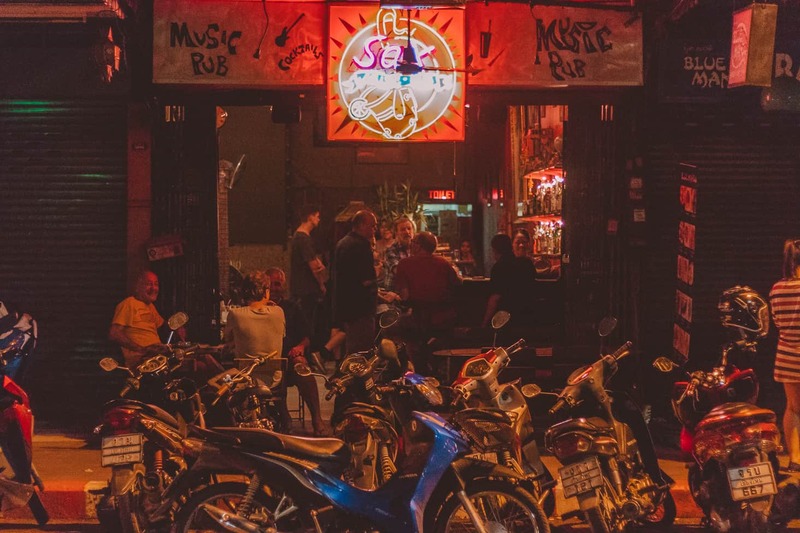 This bar attracts a relatively large and young crowd, making it easy to mingle and a great place to include on your Chiang Mai nightlife itinerary! 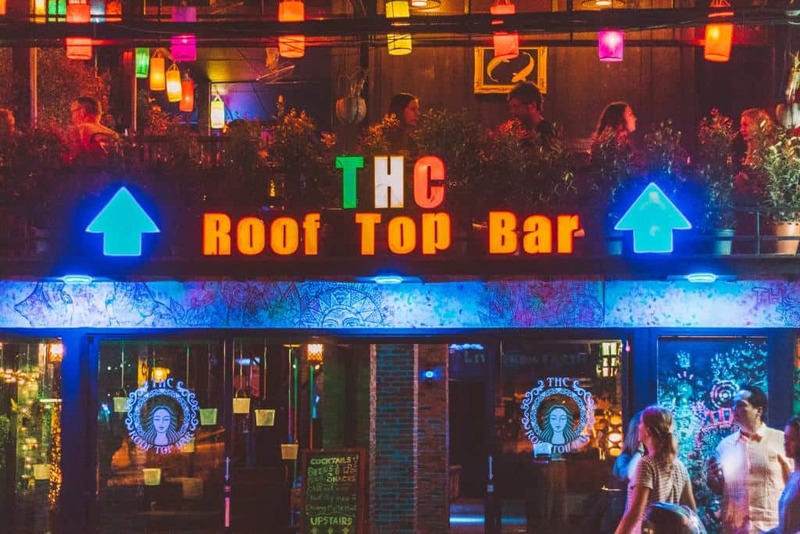 This chill rooftop bar is a great venue in which to relax and grab a few Thai-inspired cocktails at. 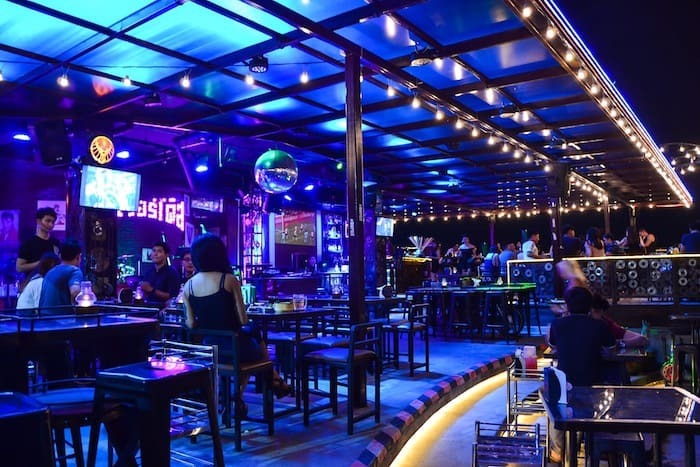 The views are just as good as the drinks and with comfortable seating to boot, it is a must-visit Chiang Mai nightlife venue! Try to get here earlier in the evening to really appreciate the good views. All around OASIS Rooftop Garden Bar is the landscaping that makes Chiang Mai one of the most popular destinations in the Kingdom, and if you frequent after dark, you will miss out on taking in the breathtaking and mountainous scenery with a delicious cocktail in tow. With sweeping views over the city and surrounding mountains, Myst offers a posh option for those wanting a swanky night out. 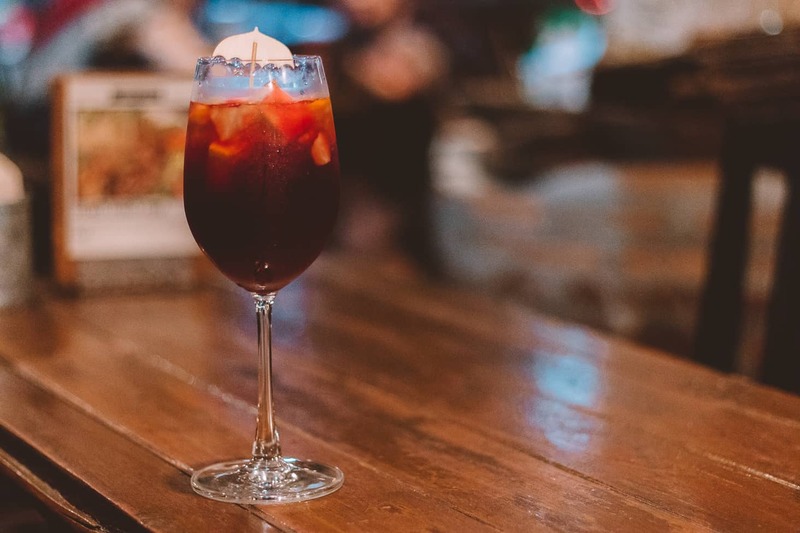 Try a unique (albeit expensive) beverage as you watch the sun go down and the Chiang Mai nightlife light up. The expert bartenders take great care to create each concoction, which sometimes means you might have to wait a bit for your drink. Luckily, there is a live band playing at Myst nearly every night to entertain you while you wait. If you are looking for something a bit more casual, the rooftop of Maya shopping mall has plenty of options. This modern shopping center is situated in Nimman, the trendiest neighborhood in Chiang Mai. 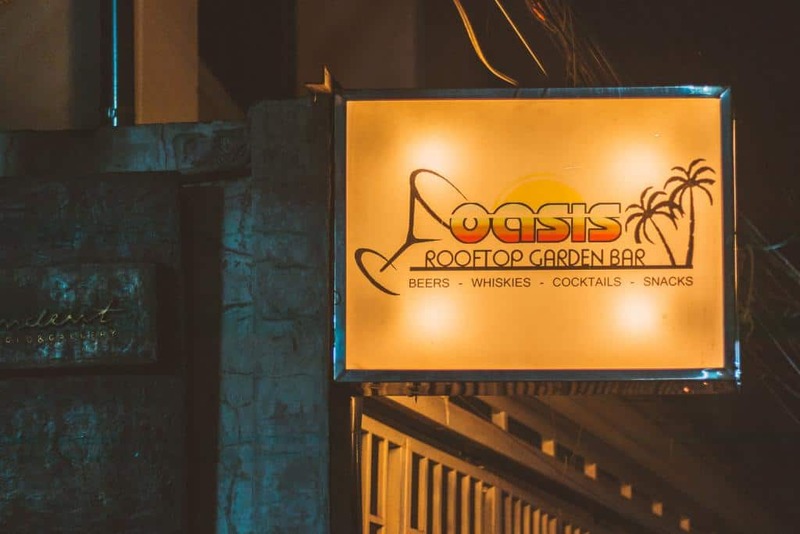 Once you pass the shops and step onto the rooftop, you will be welcomed by colorfully lit bars with live bands and DJs. Whether you want to have buckets of beers amongst the locals, a more club-vibe (DJ and strobe lights included) for a wild night out, or something more intimate with an acoustic band, you are guaranteed to find what you are looking for at the Maya rooftop. 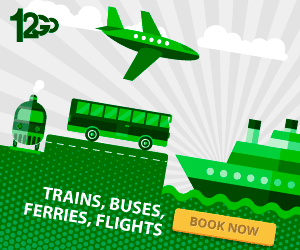 As a bonus, entrance is free at each spot and you’ll have great views wherever you decide to go! Chiang Mai might not be necessarily crawling with nightclubs, but there is still a handful of venues in which to frequent a tad bit later than the rest of the bars in town that blare some of the best tunes to get down to. Read more about our favorite nightclub below! 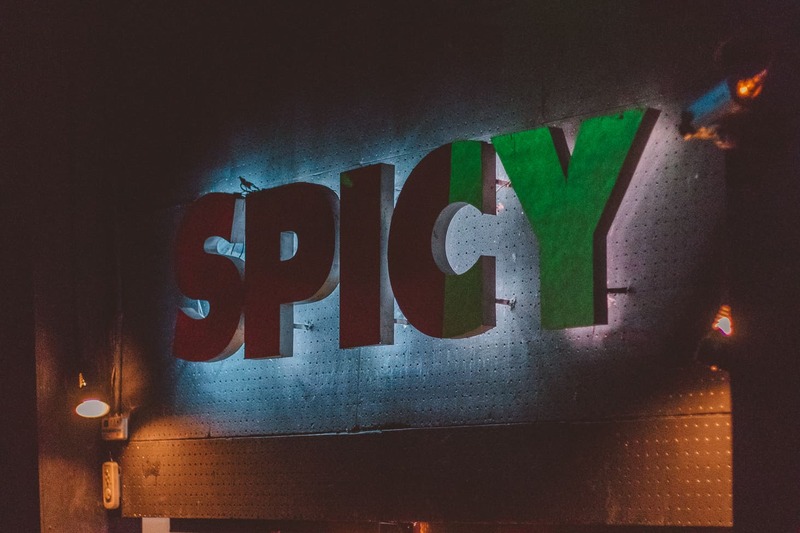 Get your dancing shoes on before heading to Spicy, arguably Chiang Mai’s most popular nightclub. 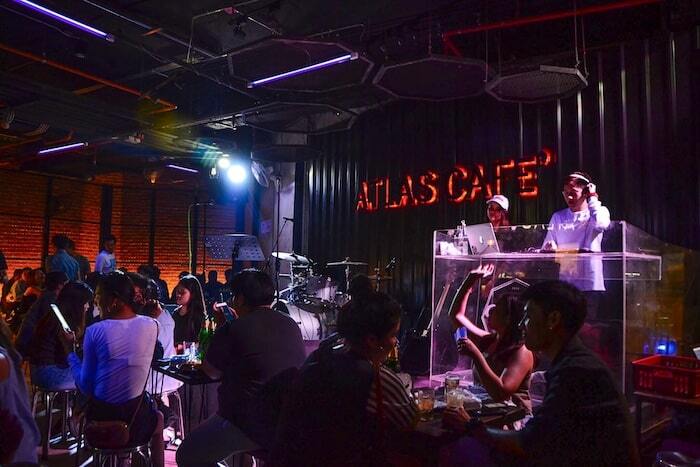 This venue has a DJ that plays top 50 chart music until about 2 a.m. Expect your usual club bangers and an oftentimes rowdy crowd, though most visitors frequent this venue for one reason only: to dance. 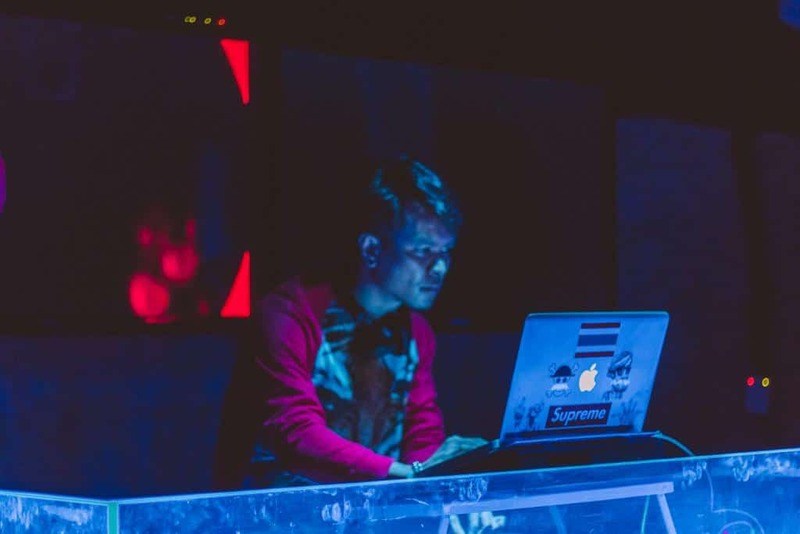 This nightclub is conveniently situated just north of the popular Tha Phae Gate, so you do not have to worry about finding a tuk-tuk home after a late night out, as well, so feel free to get those drinks flowing and enjoy Chiang Mai’s most well-known club! Hours: Daily from 8 p.m. to 1 a.m.
Chill out and enjoy the breeze at these riverside bars. Not only are these spots comfortable and cool, but they’ve got fantastic views of the river. A nice escape from the hustle and bustle of the Old City, these riverside bars in Chiang Mai are the perfect place to unwind and have a drink with your mates. 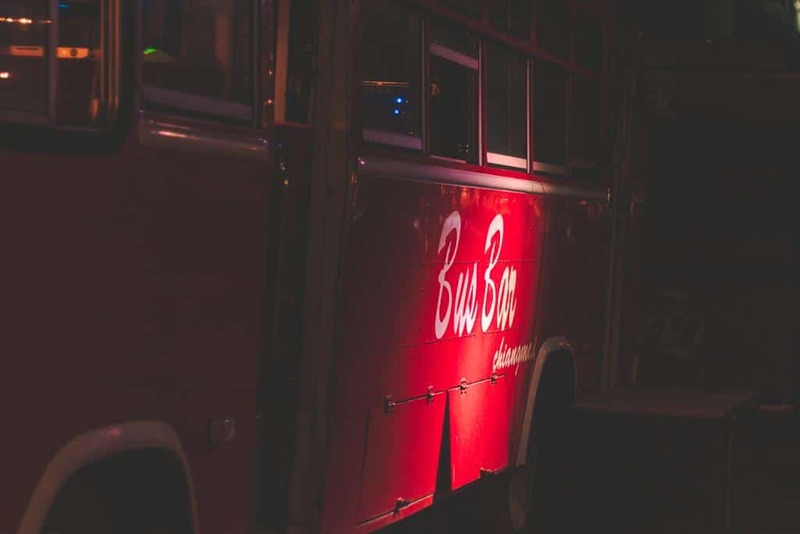 Hop on the big, red bus at Bus Bar and grab a strong cocktail, as you are in for a bumpy ride at this bar in Chiang Mai … kidding! The bus is immobile (as far as we know), but that does not mean that the party isn’t bumping at this unique, riverside bar and restaurant. Bus Bar is serving up an entire, front to back menu of unique cocktails. 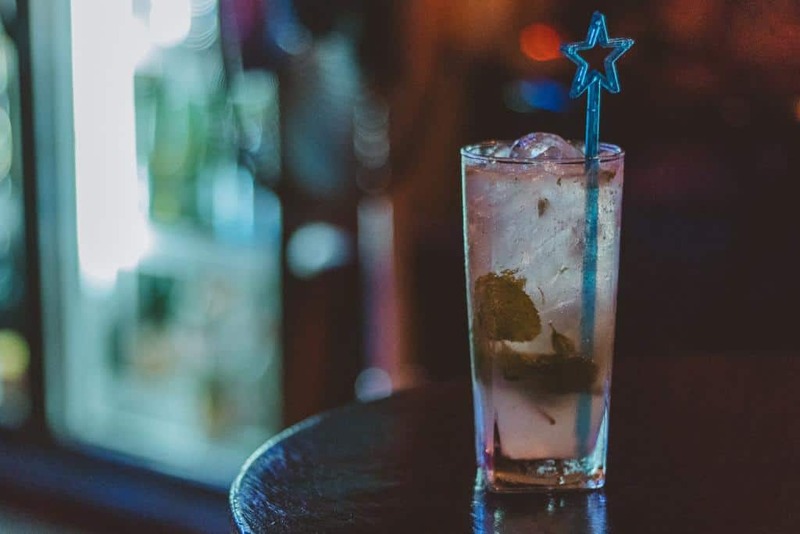 There is no signature cocktail seemingly missing from this extensive list, including usual favorites like mai tais, margaritas, and mojitos on the menu. Cocktails range from ฿135-180 in price. 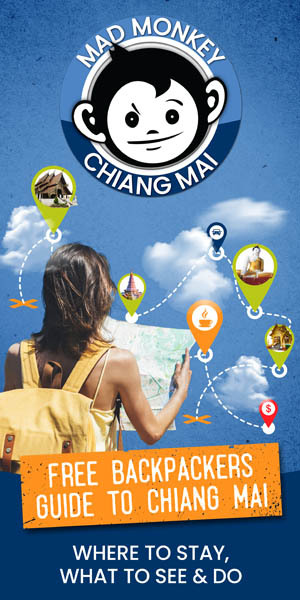 If you are on a tight backpacker’s budget, maybe instead split a bottle of Thai whiskey with some mixers amongst friends or choose one of the affordable beers on the menu, with a small bottle of Chang costing only ฿60. In addition to tasty cocktails and lovely, riverside views, Bus Bar is also serving up Thai appetizers starting at ฿80, spicy Thai salads, an entire fish menu, curries, soups, and much more. 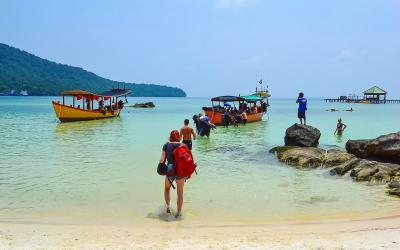 The best way to immerse yourself in a new culture is by mingling with the locals, right? At The Good View, prepare to do just that, plus a ton of partying and dancing in-between. This bar and restaurant gets packed nightly with young Thais looking for a good time. Live bands and DJs play here regularly, drawing the crowds to this open-air spot. 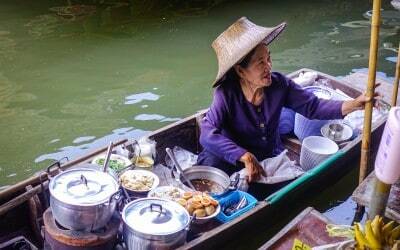 When you want to take a break from the pumping music and flashing lights, grab a table near the riverside and sample a traditional Thai dish. Their food is known to be particularly hot so make sure to accompany it with plenty of beer! 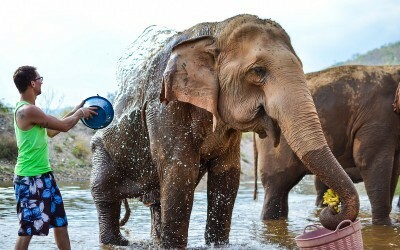 Hours: Daily from 10 a.m. to 1 a.m.
Are you keen to keep drinking in Chiang Mai? 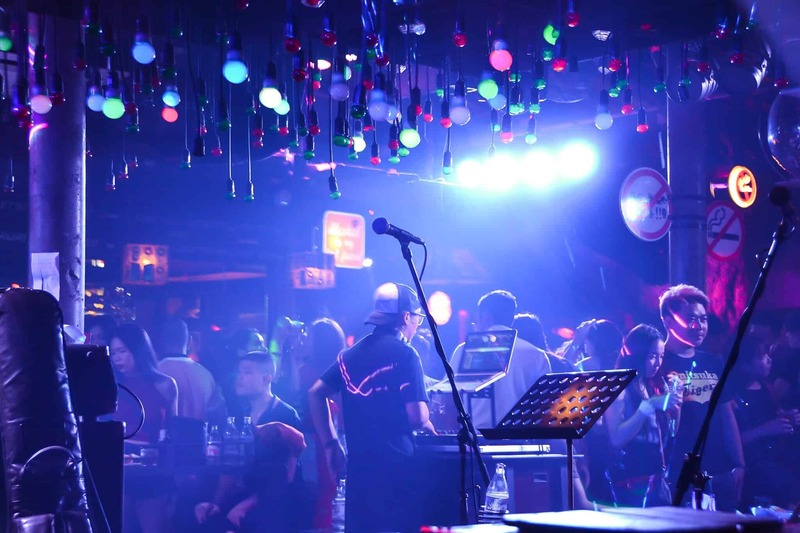 Do you want to find out even more about the best nightlife venues in the northern capital of Thailand? 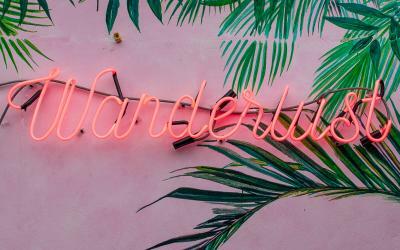 Then check out these articles that we have rounded up giving you the best information on where to go out in the city. Kirsten is the marketing manager for Mad Monkey. When she's not working, you can find her doing yoga while Netflix binging. Or more so just the latter.